You don't need an Ivy League education to realize that Mark Arcobello has been a huge reason for the Oklahoma City Barons' return to the American Hockey League's Western Conference Finals this spring. The Yale University alum with the degree in political science has moved on to an entirely different post-graduate curriculum: Intro to Professional Hockey. The Edmonton Oilers prospect's professors include the Barons coaching staff, led by head coach Todd Nelson. "His hockey IQ is a huge strength," Nelson said of the third-year pro from Milford, Conn., who has had a breakout campaign in 2012-13. "He's a smart player and he's got skill. He's not a very big guy, but he's very competitive. He's not intimidated by any means. "He finishes all his checks and plays a hard game. His skill level and hockey IQ -- his vision, his hockey sense, his creativity -- is above others in this league." Arcobello is quick to attribute his recent success to the efforts of the Barons' staff and team. "Being with OKC has been really good," Arcobello said of his time with Edmonton's primary development affiliate. "The coaching staff here has been great and has taught me a lot of things that I need to work on and things I've focused on. It's helped my game tremendously." In his three seasons with the Barons, Arcobello almost doubled his offensive production with each passing year. 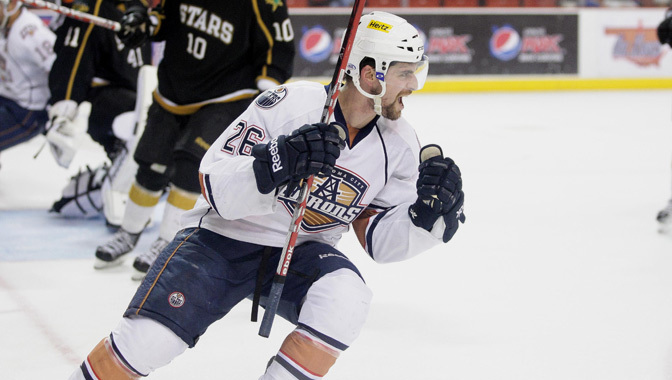 In 2012-13, he tied for third in the entire AHL in scoring with 68 points (22 goals, 46 assists). "I'm getting more comfortable playing at this level," the 24-year-old said. "I just keep going and trying to head in the right direction. As long as I keep improving on little things in my game, the bigger picture will take care of itself." Arcobello's production this season has been consistent from the start. Over the first three months of the year, he had more points than any player on the Barons not named Jordan Eberle, Justin Schultz or Taylor Hall. And when the NHL lockout ended in January, Arcobello and the Barons didn't miss a beat, actually posting a better record over the second half of the season. Arcobello's offensive prowess earned him a starting spot in this year's AHL All-Star Classic in Providence, an honor he said he doesn't take for granted. "It was awesome to play with some of the best players in the league and to get that exposure," he said. "To be recognized was awesome." A week after his All-Star appearance, Arcobello got the call to join the parent club in Edmonton and take on the Dallas Stars, his NHL debut. "It was cool to get that first game and I was just happy I got that chance," Arcobello said. "Hopefully that wasn't my last one, so I'll just keep working toward that goal of sticking in the NHL." In the meantime, Arcobello, Nelson, and the rest of the Barons remain focused on the Calder Cup Playoffs. With their win against the Texas Stars on Thursday, they became the first AHL team to claim their spot in this year's conference finals -- the same round where their season ended a year ago. "We're focusing on just trying to win games," Nelson said. "It's a battle every night. We're focusing on the first period and taking it shift by shift, period by period. We can't look ahead to anything in the future." Arcobello has remained the driving force of Oklahoma City's offense. After leading the team in playoff scoring with 13 points in 14 games during last year's run, Arcobello has AHL-bests of nine goals and 15 points along with a plus-11 rating through the first two rounds this postseason. With the dedication of a Yale graduate, Arcobello pinpoints his focus on one thing. "I just try to keep improving," he said. "Just little by little working on the small things and trying to get my game to the next level. Our team goal is to win the Calder Cup. "I'll be doing what I've been doing all year, whatever I can do to contribute to a win."